Remember back in the 90s when yo-yos were the best thing ever? I had one of those fancy Yomega Brains. If my childhood memories are correct, it was AWESOME. You might not remember who Stan is. He’s been gone a pretty long time. Here’s the start of the arc that introduces him. This entry was posted on Friday, October 29th, 2010 at 12:00 am and is filed under Comics. You can follow any responses to this entry through the RSS 2.0 feed. Both comments and pings are currently closed. Yo-yo’s do fit in with the times. Just wait for the epic yo-yo-off movies to come out next summer, it will make alot more sense then. Also I’m happy to see Mr. Dissenger again. I think this guy could get in a fight with solid snake. Again watch it without sound. It took me about a week, but I’ve read every comic now :] I dunno. I found you guys from the user spotlight (as most have recently) and found you two to be pretty interesting. I think I’ll keep watching–er, reading. I’m impressed with the improvements you both have made in the past few years. The name is my IGN for LoL. Josh can look me up if he wants. I’d like to game with one of you :] And if you haven’t yet, you should look into LoL, Jon. Thanks! Locke pulled me into LoL quite awhile ago. Twice, actually. I just started looking at this comic. Is it a total penny arcade rip off?!? No, no it isnt. This is completely original content. >_> I doubt this will be read by the original poster, but yeah, the comic is legit. 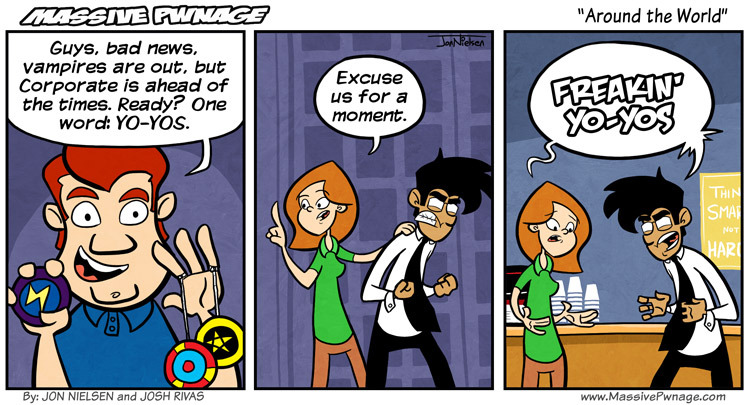 Penny Arcade got its start the same way these guys are. And although “two guys, a girl, and vid games” is the same content in both, they still differ by where their plot, the art, and the writing goes. If you don’t like it, then why are you reading anyway? Go back to your Penny Arcade, nublet.